Adolescent Attention Deficit Disorder (ADD), also known as Inattentive-type ADHD, can be difficult to detect. It is a disorder that causes inattention behavior in adolescents inappropriate to their age. Unlike other forms of ADHD, Attention Deficit Disorder often does not cause disorderly behavior, so adolescents who suffer from this disorder may go unnoticed by parents and teachers. 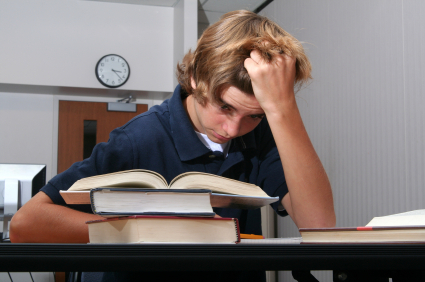 Struggling at school alone does not indicate that an adolescent has Attention Deficit Disorder. For a therapist to consider a diagnosis of adolescent Attention Deficit Disorder, symptoms must have been present from childhood, must manifest themselves in more than one setting (e.g., school, home, or work), and must interfere with successful functioning in two or more of those settings for at least six months. For example, an adolescent who is having problems at school but is fine at home, at work, and in social situations would not be diagnosed with Attention Deficit Disorder, but might have another problem (e.g., a learning disability). If your adolescent was diagnosed with Attention Deficit Disorder as a youngster, the beginning of adolescence is a good time to have him reevaluated, because symptoms of Attention Deficit Disorder can change during this time. The normal struggles of adolescence can be especially difficult for individuals with Attention Deficit Disorder. Though living with Attention Deficit Disorder can be challenging for adolescents and their moms and dads, adolescents with Attention Deficit Disorder can learn to deal with their challenges. Attention Deficit Disorder sometimes gets better with age, but in some cases, the associated learning disorders do not improve, and the adolescent may develop problems with disorderly behavior or insubordination. Many adolescents with Attention Deficit Disorder, however, are able to learn to function well as young adults. The cause of adolescent Attention Deficit Disorder is unknown. It is not caused by problems at home or school or poor parenting, though these factors may cause additional difficulties for these adolescents. Researchers currently believe the main causes for adolescent Attention Deficit Disorder are neurological imbalances and genetics. Exposure to alcohol or cigarette smoke in the womb, premature birth, or exposure to lead may increase the risk of this disorder. The professional who evaluates an adolescent for Attention Deficit Disorder can be his or her psychiatrist, a neurologist, a psychologist, or a clinical social worker. A doctor, neurologist, or psychologist can also prescribe medication, if needed. A psychiatrist, psychologist, or clinical social worker can provide counseling. The doctor should diagnose the client by checking his or her medical records, talking to parents, teachers, and others (e.g., coaches), and if possible, by observing the child in a variety of setting and activities. Are the behaviors periodic or more continuous? How do the behaviors affect the adolescent's life at school, at home, with friends, and in extracurricular activities? How long have they been going on? How many symptoms are apparent? What related problems does the adolescent have? Researchers do not agree on the best treatment for Attention Deficit Disorder. This is because the disorder can range from being hardly noticeable to being extremely noticeable almost to the point of disruption in the classroom. Many child and adolescent psychiatrists are quick to prescribe drugs for treatment, but many times very effective treatment can be achieved by changing the adolescent’s diet. Removing things such as sugary breakfast cereals, soft drinks, cookies, and chocolate from an adolescent’s diet can many times be as effective as prescription drugs, depending on the severity of the disorder and the willingness of the mother or father to take what many may consider “drastic measures” to remove such “staples” from their teenager’s diet. • Anonymous said... My 8 yo Aspergers son has severe meltdowns. He is inappropriate in social settings. He has no "stranger danger" even when we talk to him. Reads like a pro in 3rd grade class but has been tested and came in as a 4 year old. Therefore the behaviors and meltdowns. He has been diagnosed with ADHD, ODD, EDD, IDD and Bipolar. We are seeing also that he is OCD when it comes to food on his plate where the different foods cannot touch. This is a hard road and hope high school will be on his horizon because of all his early intervention and his present intervention. • Anonymous said... I need help with the following issue: My 14 year old daughter flees the house every time there is a minor problem. She punches doors and is destructive at times. She leaves even when punished. If you try to restrain her it gets very physical and she loses it. • Anonymous said... Hi Mark, This article came so timely for me, it is like heaven sent, thank you. My son was recently diagnosed with ADD inattentive type by our neuro specialist. I never heard of this type of ADD & was very sceptical but after reading your article, I agree that my 16yo son may very likely has the disorder. He was in gifted classes till 3 yrs ago when his dad passed away. Are You Creating A Monster?